Sweet Plum Indoor Bonsai Symbolises new life, renewal and creativity. 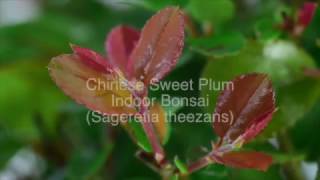 The Chinese Sweet Plum [Sageretia theezans] is a beautiful and highly recommended variety of indoor bonsai. Perfect for beginners and with so many attributes.... small plum like fruits as it matures, lovely red tinged new leaves, stunning shape & character. This example has slender taper, a lovely S-shaped trunk and is potted into an aged mottled green ceramic pot with fluted corners. The Sweet Plum signifies new life, renewal and creativity - lovely meanings for any tree variety.